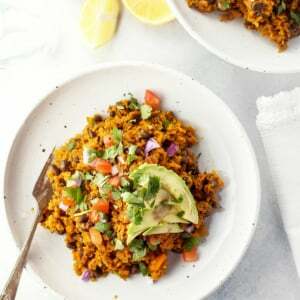 A quick and healthy burrito bowl made with sweet potato "rice" for a nutrient-rich meal. While the veggies are cooking, process the sweet potato chunks in a food processor to create a rice-like texture. Add the riced sweet potato to the pan, along with the salt, chili powder, cumin, beans, and a splash of water to help prevent sticking. Cover the pan with a lid and let the vegetables cook until the sweet potato rice is tender, about 8 minutes.